1. 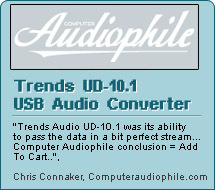 Can Trends PA-10 Tube Headphone/Pre amplifier be the Phono Amplifier ? No. Trends PA-10 Tube Headphone/Pre amplifier does not support RIAA. The CD is normal input. The PC/iPod input with higher gain is provided for small output Phono amplifier or PC/Mac/iPod. 3. It is very loud, boom with flabby bass when I turn on Trends PA-10. Why ? It is normal that the vacuum tube have to warm up for several minutes to the stable condition. The temperature is also a factor for the bias voltage. 4. I once accidentally turned on the Trends TA-10 T-amp before I turned on the Trends PA-10 Pre-amp and the tube kept blinking with an intermittent popping sound. Any explanation for that?
. Trends PA-10 Pre-amp TA-10 amp./other Power amp. 5. How can I change another vacuum tube for Trends PA-10 Tube Headphone/Pre amplifier? Trends PA-10 Tube Headphone/Pre Amplifier supports two major tube series: (1) 6DJ8, 6922, 6N11, 6H23n, ECC88, E88CC, etc…, and (2) 12AU7, 5963, 5814, ECC82, etc… If you change the tube within the same series, it needs to re-tune the DC bias voltages ONLY. If you change the tube from another series, it needs both to re-tune the DC bias voltages and re-set the jumpers. Otherwise, the tube may be burnt out. 6. How do we set the best sound performance from the Trends TA-10 Amp and Trends PA-10 Tube preamp bundle? 7. Using the headphone, I only get sound in one right ear. There is a very slight sound in the other left ear. The DC bias for the left ear channel may be incorrectly (as close as to +16.5V). Kindly refer to Bias Setup for making the balanced both ears. 8. Why Trends PA-10 tube headphone amp. provide better performance for high-impedance headphones? High impedance phones work better with amps that can do strong voltage swings, usually tube-based for best results. Low impedance phones correspondingly are supposed to work best with amps that deliver high current, such as solid-state designs. 9. Are RCA outputs muted or not when the headphones are connected to the preamp? Not muted and the outputs are simultaneous.